The ice seems to be coming in up north. It's that time of year where winter comes and goes on a weekly basis. It's coming though, and it's looking like next week may be the first really solid week of winter. That's about average for most winters. Over the past few years I've headed to the New River Gorge for the short Thanksgiving break. 12 hours of driving each way for 2-3 days of climbing hardly seemed like a reasonable proposition this year though. We missed Roger (from the Roger's Rocky Top Retreat) and our other friends in the New but found the break to be much more restful. During transition times in the Northeast it's hard to find good climbing. It's a bit too cold to rock climb, and most of the steeper ice hasn't come into shape yet. Yes, you can climb moderate rock routes or easy ice routes at some of the higher spots but there really aren't too many great options. 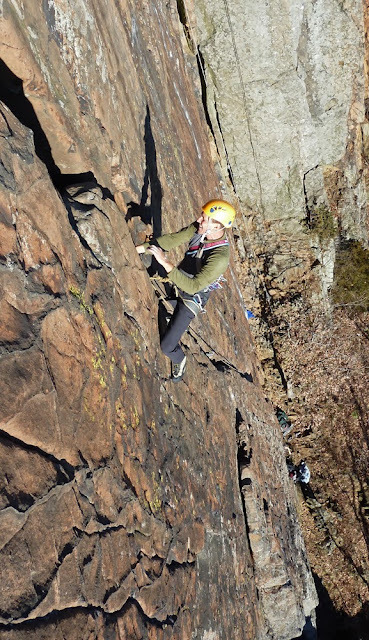 One good cold weather rock climbing option is East Peak in Meriden. This south-southeast facing cliff has a few very nice climbing options. 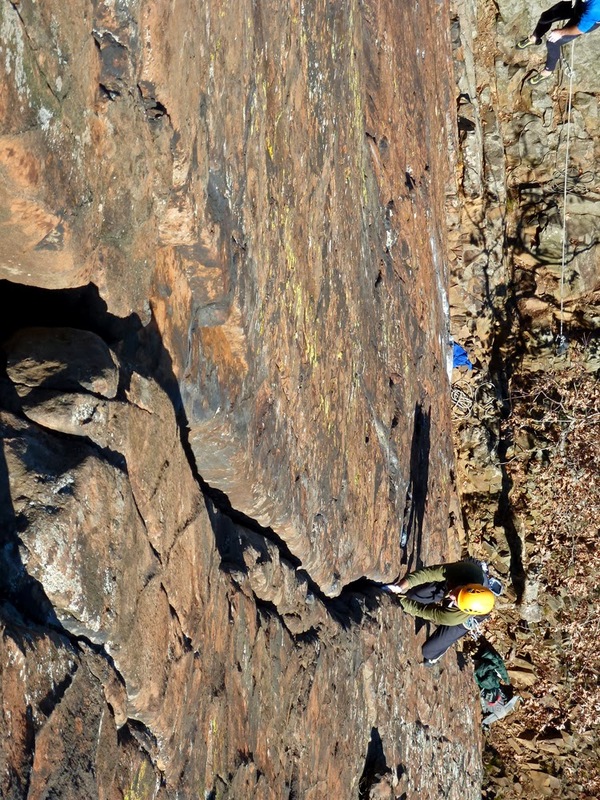 I have a love-hate relationship with traprock climbing in Connecticut. The good spots are great, with solid rock and classic climbs that rival the classics at any other east coast crag. The rest is, to be quite frank, utter junk. If you're not climbing classic routes you're generally scared, frustrated and perplexed even on a toprope. Helmets are a great idea all the time, as a climber or belayer, as are thoughtful belay stances to avoid climber and hiker induced rockfall from above. Additionally, at spots like this a Grigri is a must; if you're belayer is hit while belaying it could save your life. East Peak is so sunny and sheltered that you can often climb there on really cold days. As long as it's sunny climbing there will be pleasant regardless of the cold. I'm always surprised by the number of climbers that haven't checked out Connecticut's climbing. Last Sunday we met up with long time Gunks climber Lucho Romero for some climbing in the amphitheater at East Peak. 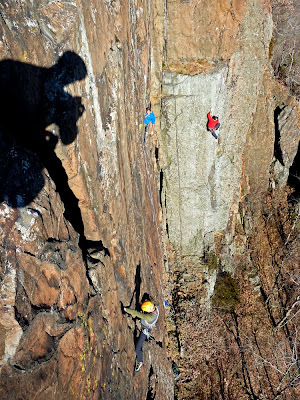 Despite over 20 years of climbing around the northeast he had never visited Connecticut to climb. I was able to snap a few decent photos of him on Cat Crack, one of the most classic crack lines in Connecticut. Cat Crack has meaty, stuffer jams the whole way. A wrist-swallowing jam is never more than a long reach away but the climbing is always sustained, which makes this 9+/10a feel hard. The other routes in the amphitheater are also very good, with Dol Goldur being one of the best hard routes in the northeast. Many CT climbers will tell you there's no hard moves on it; they're a bunch of sandbaggers. Dol Goldur is a hard 11+ and would probably be graded 12a/b in most other places. 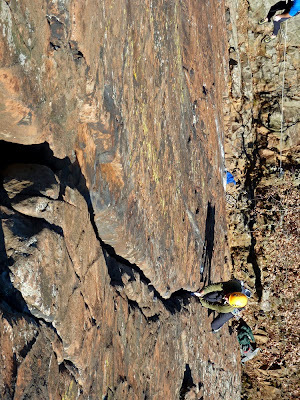 Connecticut, which is by no means a destination spot to climb, has some of the best and most accessible winter rock climbing. This alone makes it worth the visit. Check it out for yourself if you haven't already. Don't forget your helmet and Grigri though, and some static rope for the long toprope anchors.